To throw the ultimate backyard party or barbecue, look no further than Kegco's Ultimate Tower Conversion Kit, which comes with everything you'll need to quickly and easily convert a refrigerator or freezer into a home brew beer dispenser. This kit includes a 3" diameter stainless steel draft tower that makes it perfect for use in outdoor applications, and can be ordered with your choice of ball lock or pin lock keg couplers to fit your needs. 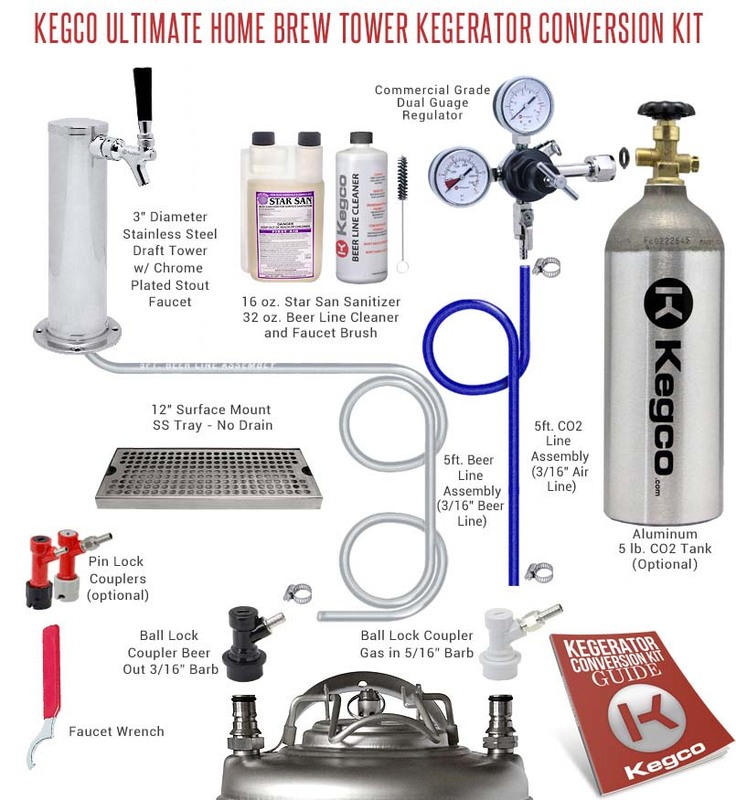 Not only does the Ultimate Tower Conversion Kit include high quality commercial-grade parts like an intuitive dual gauge regulator, but Kegco has also thrown in a stainless steel drip tray and a 32 oz. bottle of beer line cleaner, 16 oz. bottle of Star San, and faucet brush to keep your entire dispense system squeaky clean. All of our kits come with detailed instructions to take the guesswork out of the conversion process, and our knowledgeable product specialists can be reached at 1-800-710-9939 if you have any further questions. This NSF approved 3-1/2 diameter air-cooled stainless steel draft beer tower with chrome-plated brass faucet is the same tower used in many commercial beer dispense systems! It comes complete with an NSF Approved chrome plated metal faucet with brass lever and a black ABS plastic faucet knob. A 5' length of 3/16" I.D. beer line extends from the bottom of the tower. The thermoplastic vinyl beer hose reliably meets all of the demands for beer dispensing systems. It remains flexible and durable at recommended temperatures and pressures, is unaffected by normal cleaning compounds, and will not rot, swell, or dry out. This kit includes a 32 oz bottle of beer line cleaner, a 16 oz bottle of Star San sanitizer and a faucet brush to keep your system squeaky clean. Simply mix some of the beer line cleaner and water in your keg and run it though your lines like you're pouring a beer to remove protein and mineral deposits from the tubing. Sanitize your kegs with Star San, the most popular keg sanitizer on the market. It is non-toxic, odorless and tasteless and requires no rinsing when used under 300 ppm. The faucet brush makes cleaning any residue out of the spout a snap. To clean your beer lines, mix a solution that is 1/2 oz. of beer line cleaner per quart of water in your home brew keg. Pressurize your keg and pour the beer line cleaner through the lines just like you're pouring a beer. The solution will remove beer stone, bio-film, yeast, protein, organics and mineral deposits from your beverage lines. The nitrate free formulation is 100% biodegradable, but it's a good idea to do a second run with clean water to rinse out the lines after using the solution. Star San is an acid-based sanitizer that works quickly and effectively and is self-foaming to hit all those hard-to-reach areas. When used under 300 ppm (1 ounce per 5 gallons = 300 ppm), it can be used as a no-rinse sanitizer; any remaining foam is non-toxic, odorless, and tasteless, and will not effect the quality of your beer. Kegco Ultimate Home Brew Tower DIY Kegerator Conversion Kit..... Will this work for any keg?